The View composer service is responsible for the creation and provisioning of the Virtual Desktops within vCenter. In View Manager, create a new Automated linked-clone pool. View Manager creates the linked-clone entry in View LDAP and puts the virtual machine into the Provisioning state. The View Composer Server creates the machine account entry in Active Directory for the new clone and creates a random binary password for the newly created computer account. 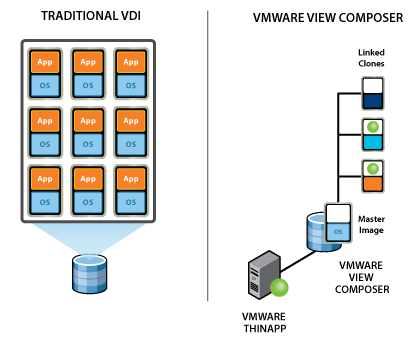 View Composer creates the linked clone using the vCenter Server API. View Composer creates an internal disk on the linked clone. This small disk contains configuration data for QuickPrep or Sysprep. The disk also stores machine password changes that Windows performs every 30 days, according to the policy setting. This disk data ensures that domain connectivity is maintained when a checkpointed desktop is refreshed. A recompose operation lets the administrator preserve the View Composer persistent disk and all user data inside this disk while changing the operating system disk to a new base image and snapshot. With recompose, an administrator can easily distribute operating system patches and new software to users. Recomposing between major operating system versions are not supported (XP >Vista, XP >Windows7, Vista >Windows7). Because a new operating system disk is created during a recompose, the clone is also customized again during the recompose operation. When the customization is completed, View Manager takes a new snapshot. View Manager puts the linked clone into the Maintenance state. View Manager calls the View Composer resync API for the linked clones being recomposed, directing View Composer to use the new base image and snapshot. If a replica for the base image and snapshot does not yet exist in the target datastore for the linked clone,View Composer creates the replica in the datastore. If a separate datastore is configured to store all replicas, a replica is created in the replica datastore. View Composer deletes the current operating system disk for the linked clone and creates a new operating system disk, linked to the new replica. The rest of the recompose cycle is identical to the customization phase of the provisioning and customization cycle.